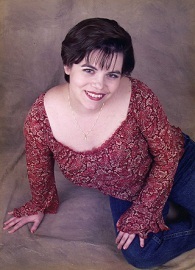 Christina Freeburn is a new-to-me author. 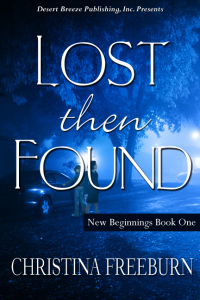 Lost Then Found showed a lot of promise, and I’m looking forward to checking out the rest of the New Beginnings series. 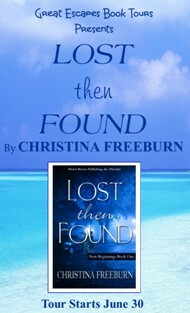 Readers of romantic suspense should check this book out. The writing was superb in this book. The author has given us a suspenseful plot while blending in the spiritual and romantic elements flawlessly. There was definitely a lot of suspense in the story. I enjoyed the character and family dynamics in this one. She entered into the small room and Jonas followed, stepping into the dark office. The room had one small window near the top of the wall. A coat of dust blocked out most of the sunshine. Without a word, Jonas complied. Sweat coated her hands and her stomach clenched. Give her a screaming, profanity-spewing ex-husband of one of her clients instead of an indifferent and calm Jonas Knight. To hide the tremble wanting to buckle her knees, she slid onto the desk and thumped her heels against the marred wooden legs of the hand-me-down furniture. “All I want to do is help you.” Jonas leaned forward, decreasing their distance. “I can handle a man like Howard.” She scooted back a few inches. “And I did. I don’t need you showing up here putting my staff and my clients in danger. What if he followed you again? I thought you were better than that.” The baiting words flowed from her before thought stopped the spitefulness. Blankness filled his gray eyes. Jonas steepled his fingers and pressed them against his lips. Renee had always assumed the lack of readable emotions came from being a top-notch skip tracer, not an ingrained personality trait. She learned otherwise, discovering love couldn’t…and wouldn’t…change it. A smile inched up the corners of Jonas’ mouth. Her heart fluttered. His smile always affected her. The first time she saw it, he stood in front of the classroom listing his credentials. The grin grabbed her and reeled her in. She focused on the shape of his mouth rather than the words coming out of it. The paper in front of her remained blank, and she had to take that particular seminar again. The next time, she chose a different instructor as the handsome, renegade Jonas Knight distracted her attention and captured her heart. In three months, he swept her off her feet and to the altar. Her heart had never known such happiness. A memory of her sister’s funeral trickled into her mind. Or pain. Jonas had stood beside her, arms crossed, staring into the distance without a flicker of emotion on his face or in his eyes. Renee had needed the feel of his arms around her, to lean on him and gather strength, but Jonas denied her comfort that day. He closed himself off to her, to her parents, to Alex. Her husband turned himself into a stranger the day she needed him most.